Cars are shown on the Queen Isabella Memorial Bridge. Plans to build a second bridge to South Padre Island have stalled during the environmental impact stage. SOUTH PADRE ISLAND — After the Queen Isabella Memorial Bridge partially collapsed in 2001, South Padre Island residents had to ride a ferryboat to get to and from the mainland. The city turned into a ghost town, and it wreaked economic havoc in the county. A barge had struck the bridge, leading to the collapse of a 160-foot section to the only bridge that connects the Island to the mainland. Eight people died after driving off the section of the bridge 80 feet above the Laguna Madre. The tragedy underscored the need for a second causeway to serve as a backup for evacuation purposes. Many people wonder why there isn’t another way to access the Island — especially during peak seasons when cars back up bumper to bumper before and after special events. Many say the need will only grow, as the Valley’s population is expected to double by 2040. 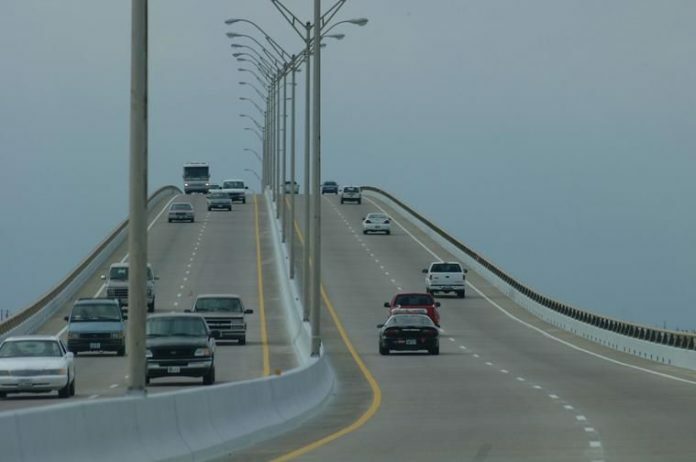 “The need for a second causeway is there, and it will always be there,” said Pete Sepulveda, Cameron County Regional Mobility Authority executive director. But while officials say the need is there, the project is at a standstill. Sepulveda reported to Island leaders recently the project to build a second causeway is waiting on the completion of an environmental summary. However, the environmental study cannot be completed until TxDOT lifts a ban on all Texas toll road projects. “We are still waiting to get a phone call (from TxDOT) to complete the environmental phase,” Sepulveda said about the TxDOT freeze on toll road projects. Sepulveda said the project is being developed as a toll road. But the intention is to request that TxDOT make it a non-toll road sometime during or after the development of the second causeway. Officials originally hoped to have the final environmental clearance by the summer of 2016. Sepulveda said it normally takes eight to 10 years to complete an environmental study. And the CCRMA has nearly reached that mark since taking on the project in 2008. One of the crucial aspects of the environmental study is the financial plan of the project. “The financial plan is the last phase of the environmental plan,” Sepulveda said. But that cannot be completed by engineers until the ban on toll road projects is lifted. Sepulveda said the financial plan would lay out the details made by the engineers on the cost projections for the causeway. He said funds to pay for the project would be requested from the state and TxDOT. The idea of a second access has been tossed around since as early as 1994. But it was not until the tragic collapse in 2001 that leaders finally moved forward on the need for it. Price projections to build the second causeway started off as low as $120 million since talks began after 2001. But projections have risen as high as $750 million, and have dropped to the range of $500 million. The Queen Isabella Memorial Bridge was built at a cost of $11 million in 1974. It replaced the previous bridge, which was built in 1954. Sepulveda also reported to Island leaders that the CCRMA changed consultants and hired Figg Engineering because of its experience working on similar projects in Texas and Louisiana. “I’m convinced, from their end, they already know how to finish the project and cut project costs even further,” Sepulveda said. Alvarez, the TxDOT district engineer, agreed a second causeway would be good for the Island. “A second causeway would provide another opportunity to get in and out of the Island should something happen with the current causeway,” Alvarez said. He said it would be a safety improvement and provide better mobility for people getting into and out of the Island. At this point, he said, the toll road ban is being evaluated by TxDOT administrators and commissioners. “They are evaluating the toll road ban as we speak. But they have not made a final decision,” he said.